The Kayayo are a class of thousands of women and girls from Ghana’s remote north who travel south to find work as porters in city markets. They make the journey to escape a region where meager subsistence farming is the primary occupation; where it is a normal practice for girls to do housework and raise their male siblings rather than attend school; and where education, infrastructure, and health care lag behind the rest of the country. In the south, they perform backbreaking labor for almost no money and sleep 10 or 20 to a room in cramped slums. Still, the girls often prefer their lives in Accra and Kumasi, Ghana’s major cities. Some use the little money they make to continue their education. Others are simply glad to be away from their parents and have ownership over their money and possessions for the first time in their lives. While the Kayayo lifestyle is often considered a last resort in a desperate situation, many of them see it as an opportunity to free themselves from the confines of village life. 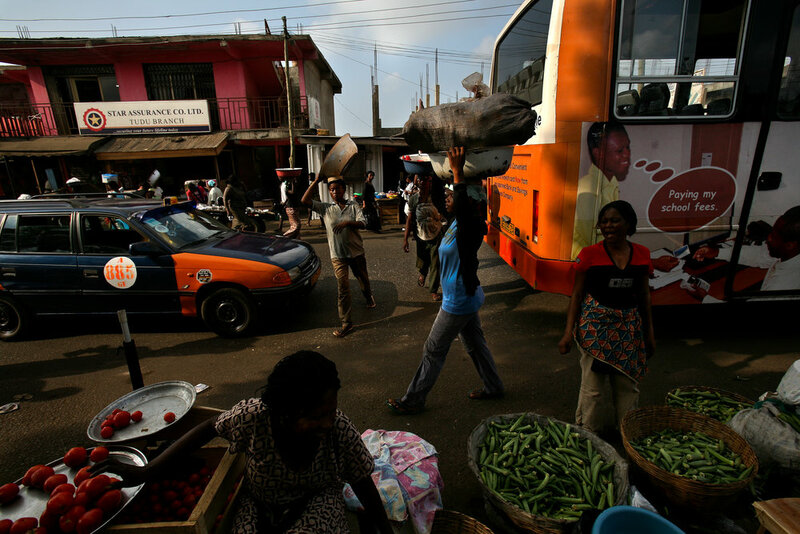 25-year-old Lamisi, center, carries a load of yams from one market to another in Accra, Ghana on Feb. 11, 2009. Lamisi graduated from Senior Secondary School in Tumu, her home in Ghana's remote Upper West Region, but had to travel to the faraway city to make money. She is hoping to save enough to pay for admission to training college for teaching or nursing. Lamisi lifts a load of yams onto her head in Agbogblushie Market in Accra, Ghana on Feb, 13, 2009. "At the end of the day, your whole body will be paining you," she says of the work. A Kayayo woman sweats after chasing a car with hopes that the passengers would pay her to carry their bags in Kumasi, Ghana on Feb. 26, 2010. The Kayayo are a class of thousands of women and girls from barren northern Ghana who travel to southern cities in search of work as market porters. Girls from northern Ghana wait for work at an intersection in Kumasi, Ghana on April 10, 2009. Amariya, a young woman who returned to her village to marry after working as a Kayayo in Accra, lifts firewood onto her head outside of Tampion, Northern Region, Ghana on March 25, 2009. As a recently married woman, she performs the majority of the chores in her husband's family household. "It is my work," she says. "I don't mind." Amariya, in Tampion, Ghana on March 26, 2009. 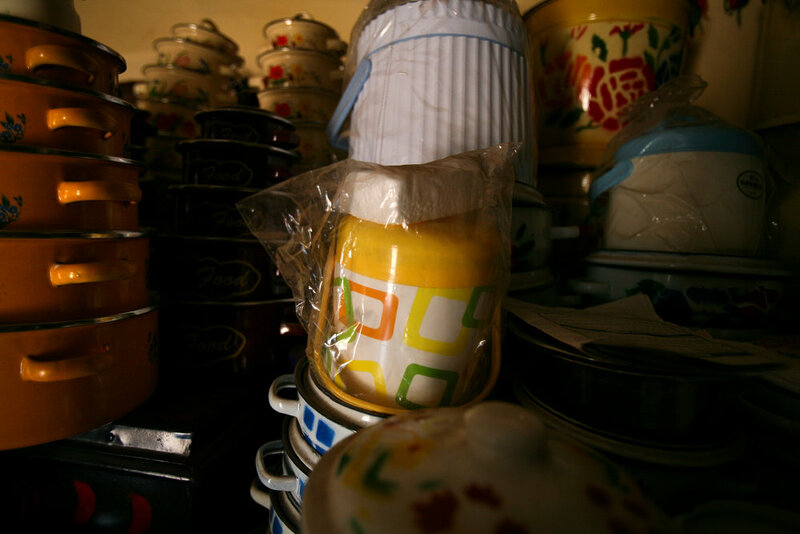 The items Amariya was able to buy in Accra while she was a Kayayo girl: pots, pans, and other kitchen items that her tribe considers necessary for her to marry. Tampion, Ghana on March 26, 2009. Amariya does chores in her husband's family's compound in Tampion, Ghana on March 25, 2009. Weeds grow in the farmland outside of Tampion, Ghana, March 27, 2009. The north's long dry season keeps villagers from farming for much of the year, resulting in a shortage of employment and trade in the region. Alietu, a Kayayo girl, walks to Racecourse Market in Kumasi, Ghana to start her workday on Feb. 23, 2009. 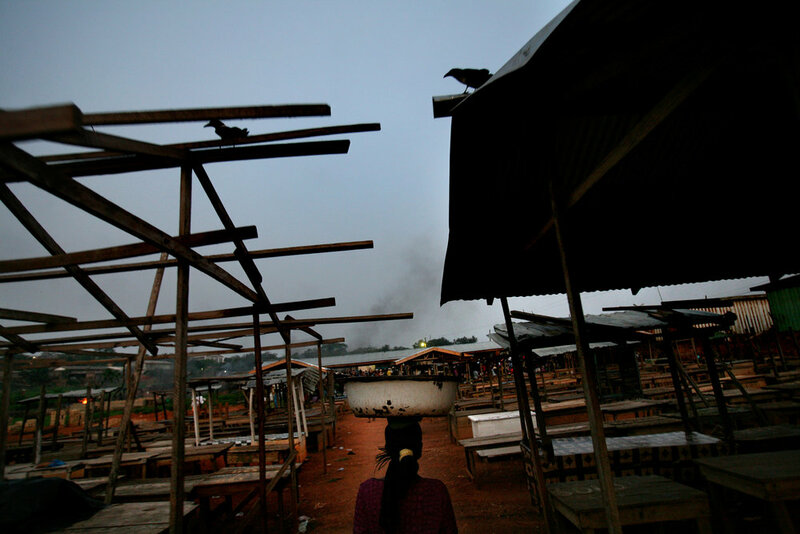 Lamisi sits and waits for work in the yam market in Accra, Ghana on Feb. 11, 2009. 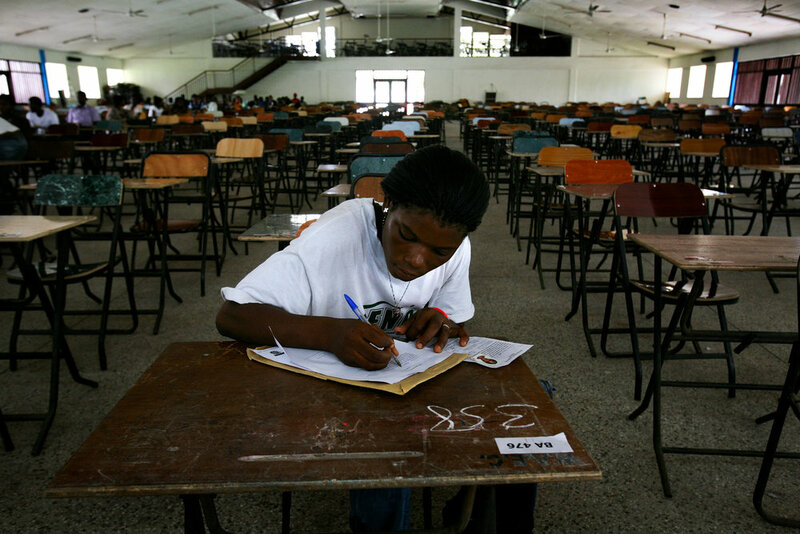 Lamisi registers for training college entrance exams in Accra, Ghana on March 17, 2009. 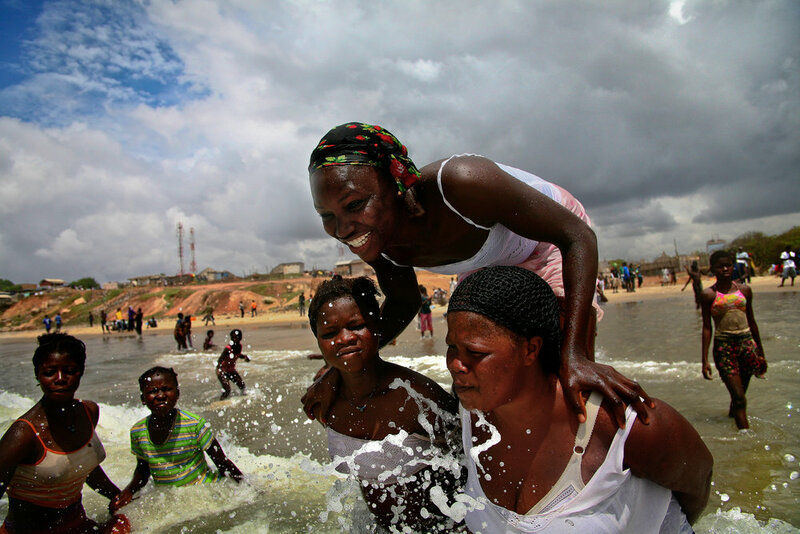 Fatima stands on the backs of other girls while playing at a beach in Accra, Ghana on Oct. 12, 2008. A Muslim girl from Ghana's north, she had never seen the ocean before coming to Accra a few months prior. "I like swimming," she says, "but I don't like how boys and girls swim together here." Teenage Kayayo girls rush to their feet to chase after a bus entering Doctor Mensah Market in Kumasi, Ghana, Feb. 26, 2009. Kayayo girls reflected in the muddy pathways of the Old Fadama slum after a rainstorm in Accra, Ghana on April 14, 2009. The area has become a haven for northerners in the capital city, and each northern tribe has a small neighborhood of shacks and semi-permanent buildings. Kayayo girls in their early teens prepare to sleep after the workday in Old Fadama slum in Accra, Ghana on Feb. 9, 2009. 14 girls from the same village sleep on the floor of this wooden shack. 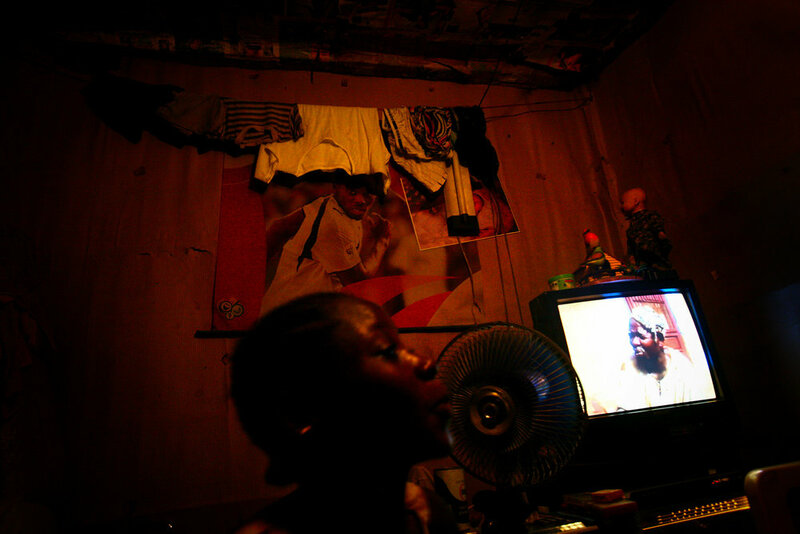 A young woman watches a film in her room in Accra, Greater Accra Region, Ghana on Oct. 5, 2008. A girl laughs in the room she shares with 14 other girls in a slum in Accra, Ghana, Feb. 9, 2009. Kayayo girls and women sleep on the floors and counter-tops in a former warehouse where several hundred of them live in Kumasi, Ghana on Feb. 26, 2009. Kayayo girls huddle together while sleeping on the floor of a former warehouse where several hundred of them live in Kumasi, Ghana on Feb. 26, 2009. Kayayo girls watch a film playing in the midst of Old Fadama slum, where they live in Accra, Ghana on March 14, 2009.